In the Windows world most data structures are stored in special binary format. Either we call a WinApi function or we want to read from special files like images, spool files, executables or may be the previously announced Outlook Personal Folders File. Before we start we need to know how this file is formatted. 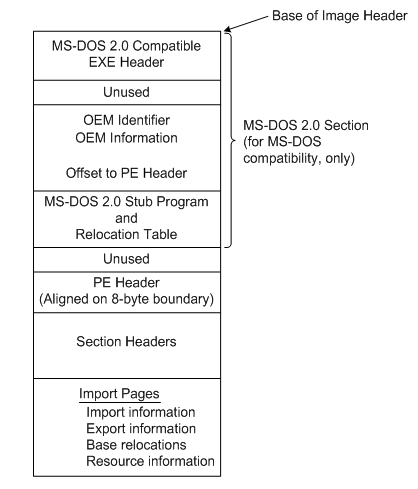 The following figure shows an overview of the Microsoft PE executable format. Our goal is to get the PE header. As we can see, the image starts with a MS-DOS 2.0 header with is not important for us. From the documentation we can read "...After the MS DOS stub, at the file offset specified at offset 0x3c, is a 4-byte...". With this information we know our reader has to jump to location 0x3c and read the offset to the signature. The signature is always 4 bytes that ensures that the image is a PE file. The signature is: PE\0\0. To prove this we first seek to the offset 0x3c, read if the file consist the signature. Then a method for moving the reader to the correct location to read the offset of signature. With this method we always move the underlining Stream of the BinaryReader to the start location of the PE signature. Now, we can check if it is a valid PE image by reading of the next 4 byte contains the content PE. With this basic functionality we have a good base reader class to try the different methods of parsing the COFF file header. All readers do the same thing, so we go to the patterns library in our head and see that Strategy pattern or Template method pattern is sticked out in the bookshelf. I have decided to take the template method pattern in this case, because the Parse() should handle the IO for all implementations and the concrete parsing should done in its derived classes. First we open the BinaryReader, seek to the PE signature then we check if it contains a valid PE signature and rest is done by the derived implementations. The first solution is using the BinaryReader. It is the general way to get the data. We only need to know which order, which data-type and its size. If we read byte for byte we could comment out the first line in the CoffHeader structure, because we have control about the order of the member assignment. If the structure is as short as the COFF header here and the specification will never changed, there is probably no reason to change the strategy. But if a data-type will be changed, a new member will be added or ordering of member will be changed the maintenance costs of this method are very high. The "magic" trick is in the statement: this = *(CoffHeader*)packet;. What happens here? We have a fixed size of data somewhere in the memory and because a struct in C# is a value-type, the assignment operator = copies the whole data of the structure and not only the reference. We saw that we can parse well-formed binary data to our data structures using different approaches. The first is probably the clearest way, because we know each member and its size and ordering and we have control about the reading the data for each member. But if add member or the structure is going change by some reason, we need to change the reader. The two other solutions use the approach of the structure assignment. In the unsafe implementation we need to compile the project with the /unsafe option. We increase the performance, but we get some security risks.